Wildfires are scary. Flooding is scary. The news is thick with pictures of burning or flooding homes, and next week there are thousands of children who will not start school because their school is either under water or their home has burned to the ground. Natural disasters occur in every part of the world – whether it is mud slides, tsunamis, droughts, or blizzards. Some parts of the world seem to experience some kind of disaster every year, and others seem immune until – surprise, surprise – something happens. A crack of lightning hits just the right spot or a cold front meets 100% humidity or a fault line that has been dormant for decades starts to shake. We live on this planet and this planet is alive. It shakes, it sweats, it expresses, it sleeps and then it wakes. Every day things happen in this world, and not all of them work according to our plans. Weddings get rained on. Soccer games get snowed on. Conventions get flooded, festivals get blown, and new homes get shaken up. And sometimes it is really bad and people die. So if we are feeling vulnerable, helpless, angry and grief stricken – then how are our children feeling? Children look to us for safety and reassurance, and can sense that we are not feeling safe and reassured – so how do we handle that? Great questions – and the answer, I think, is at once simple and complex. The complexity has to do with your family values, geography, and culture. What access does your child have to the media? Do you often volunteer to help those in need? What family stories do you share around natural disasters? These are some of the complex questions you may consider when talking about the wildfires or floods or any other natural disaster. But the simple response is where stories can help. Here we think about “humanity” in the broad stroke – not in the details. We don’t get caught up in particular incidents, particular events, particular responses - and instead focus on the underlying fears and then the universal desire to help those in need. I am safe and loved. It is okay to feel sad, mad, or scared. These truths may not seem like truths to we grown ups. It may be hard for us to validate "I am safe" when children are trapped in collapsed buildings after a tornado plows through their town. But we are not talking about us, we are talking about children – and a foundation of "I am safe" is a gift we can give them. This gift can inform how they meet challenges, disasters and tragedy. If their "broad stroke" sense of the world is that they are safe - and that they can help those in need – then they can enter into difficult situations with a kind of confidence and clarity that will help not only themselves but those around them. 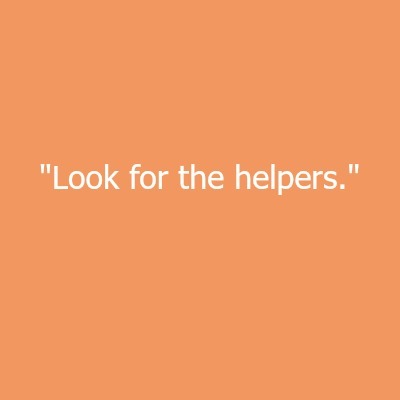 So when they help others – then they can see everyone around as Helpers too. "Helpers" is a story to help families with young children meet with news and experiences of natural disasters. "Helpers" is a short story about Dennis, a happy little six-year-old boy who wakes one morning to see his mother listening to the radio in the kitchen. She turns it off, but Dennis can tell that something is wrong and that his mother is feeling sad – and maybe a little scared. She explains that something happened, a big storm moved through a town, and buildings were damaged and people were hurt. She then tells him about how all the people on their street, in their neighborhood, and in their town that want to make sure that he, Dennis, is safe. We hope this helps as you comfort your child, reassure them, and then decide how your family wishes to help those in need.